Rafflin Aluminium and PVC combines modernity and tradition to give you customized entrance doors with aesthetic features and high quality techniques. To meet the diversity of styles of the homes in the Gulf of Saint-Tropez, ranging from the traditional Provencal style to the modern and contemporary architecture, our company selects the most suitable products based on the feature of your home and its environment. Whether it is a large arched wooden entrance double door, or a door with modern and simple design or even a mixed solution, we offer a wide choice of colours and patterns. We can also customize your door thanks to the traditional Rafflin carpentry. We will consider your project as a whole, whether it is a construction or a renovation, we will provide advise and offer you models designed and studied to respond in an optimal way to the demands for thermal isolation, soundproofing and security of your home. 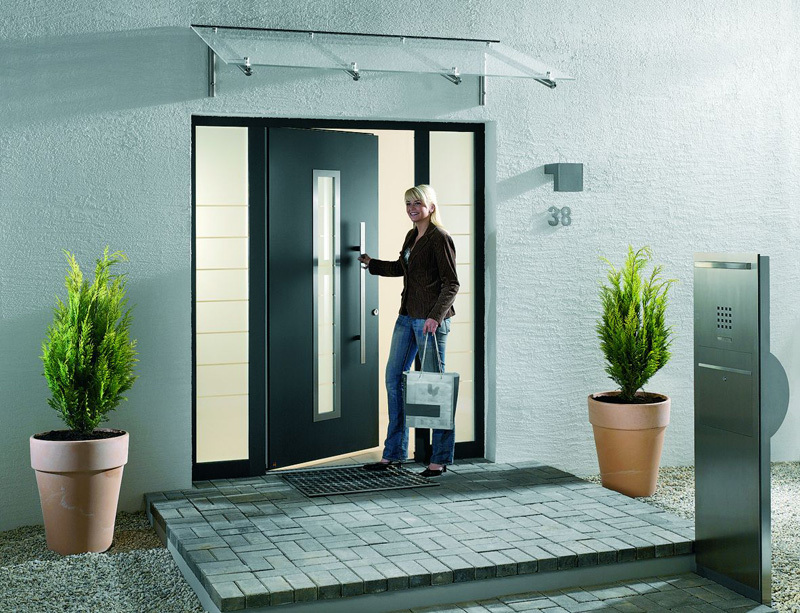 Aluminium entrance doors : Soundproofing and high thermal isolation, high resistance (UV, corrosion) and stability . Excellent security with several lock models and a very large range of colours (Pantone colour chart). PVC entrance doors : A very good insulator and large selection of competitive priced models. The advantage of modern materials for all design trends. Composite entrance doors : Aluminium alloy, fiberglass and Corian® provides high insulation and stability while requiring little maintenance. Available in a very large range of colours (Pantone colour chart). Wooden entrance doors : The traditional material par excellence. Available in modern single piece or traditional carpentry style. Steel entrance doors : A cheaper model with a 5 point serial lock, anti-theft system Class 2 (side pieces and crossbars reinforced) and invisible opening frame for a seamless finish appearance.